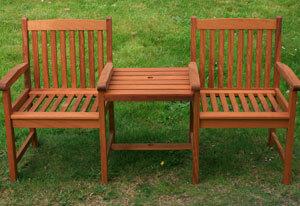 Lingley Woodcraft are very pleased to offer for sale our garden furniture range. 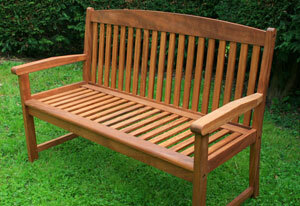 All the items for sale on this page are manufactured in our joinery workshop in Old Warden. All this furniture is properly crafted with each section mortice and tenon jointed together to create an item that not only looks good, but has year after year longevity. 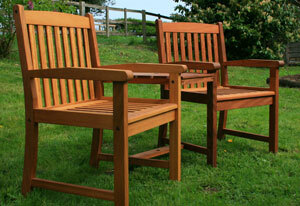 All the furniture featured here is made from solid iroko, which is a very long lasting durable wood. 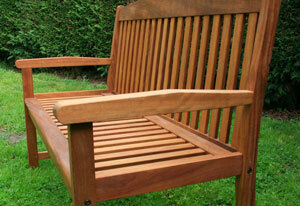 The iroko used is grown and imported from certified sustainable sources. Because of the precise traditional construction, our furniture is sturdily built, but light to move about.The furniture is supplied flat pack with concise assembly instructions, and are assembled using quality, flush allen key bolt fixings. (Allen key supplied). All prices shown include VAT and carriage. To order please call. 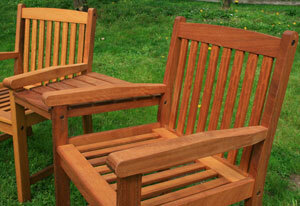 This furniture is supplied finished in Danish oil. 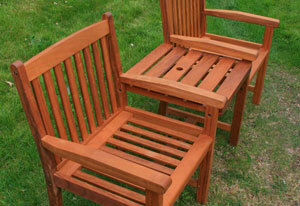 Storage through the winter and a fresh application of oil in the spring will maintain its supplied lustre. Alternatively, unmaintained and left to weather, iroko has its own yellow/silver patina. We would expect that a lifespan of 20 years is not unrealistic, longer if well maintained.